Spencer Bohren utilizes a variety of guitars much like a painter uses a paint box, and he paints his sonic pictures using whatever instruments he feels are appropriate for a particular situation. In live concerts, he tends to use two or three guitars, a couple lapsteels and, if he’s driving instead of flying to the gig, a banjo. In the recording studio, Spencer usually brings an embarrassing number of acoustic and electric guitars, lapsteels of every description, plus a banjo and a mandolin. He will even borrow friends’ instruments if he has to to find the sound he’s seeking. If he could only have one guitar, Spencer would no doubt choose his trusty sunburst 1955 Gibson J-45, purchased from Harry Tuft at the Denver Folklore Center in 1968. This guitar has been around the world countless times, seen every highway and byway in America, and has been stolen twice! The story of one of those thefts is told in John August Schroeter’s fun book, Between the Strings, published by Mel Bay. 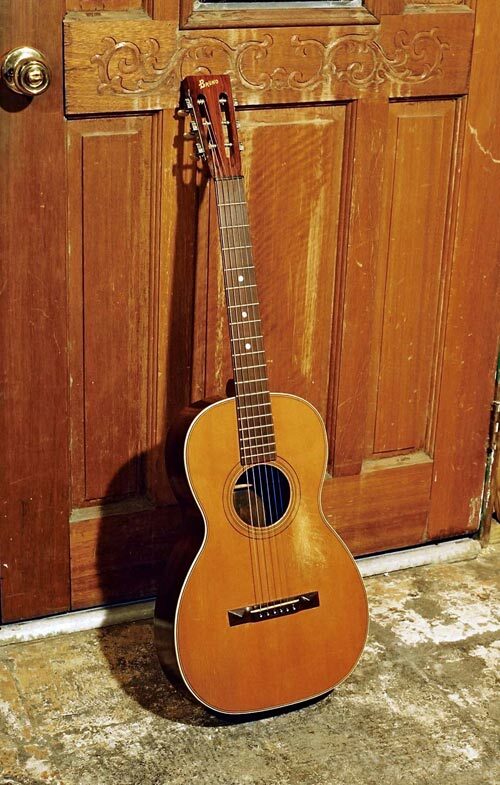 Other acoustics Spencer has loved include a sunburst Guild JF-30, a 1920s Kalamazoo Carson Robison endorser model, sold by Montgomery Wards, a sweet little 1897 Bruno parlor guitarmade of rosewood in New York City, and a Max Krimmel “Plain Jane” from the 1970s. 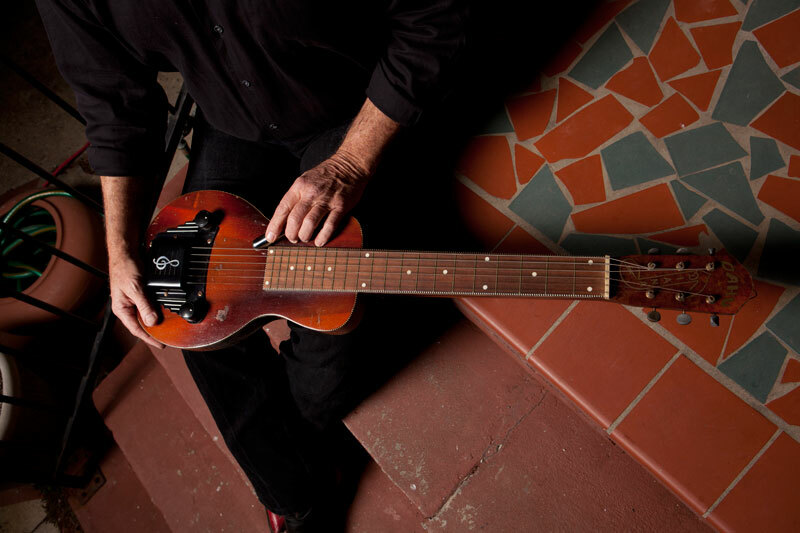 The lapsteel guitar stole Spencer’s heart some twenty years ago and he has played several of them in the intervening years. Currently, his favorite is a 1950 Tonemaster, made by the Valco Corporation, which was offered to him by the sons of the original buyer who never played a note on it. It’s not the prettiest steel guitar in Spencer’s closet, but the sound is superlative. The prettiest one would have to be his 1939 National New Yorker, designed to resemble the then-new Waldorf-Astoria in New York City. It is a deco dream, resides in its original case, and sounds great. 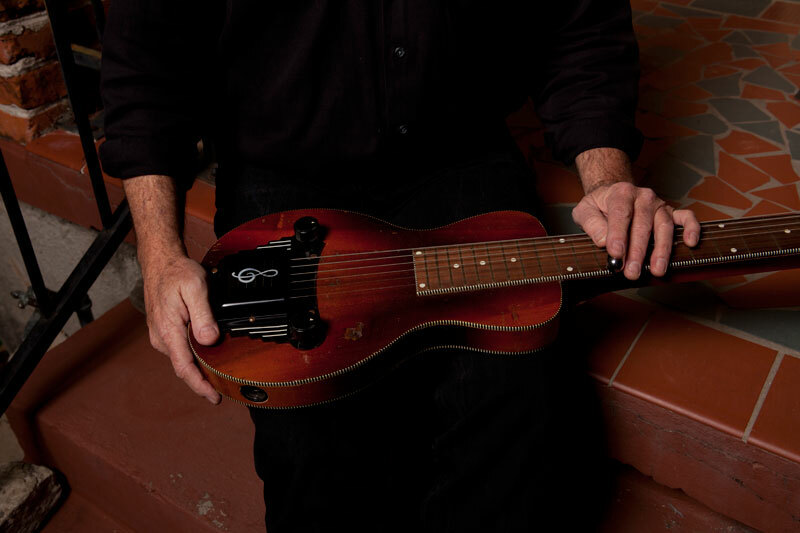 Spencer also enjoys an asymmetrically designed Supro lapsteel with legs, which he purchased with funds raised by the Cleveland Blues community to replace instruments lost when the levees failed in New Orleans following hurricand Katrina. He has a couple others to use when the fancy strikes him, and like the others, they are made by the Valco Corporation. There just seems to be something about those pickups. Spencer has two acoustic lap guitars as well. 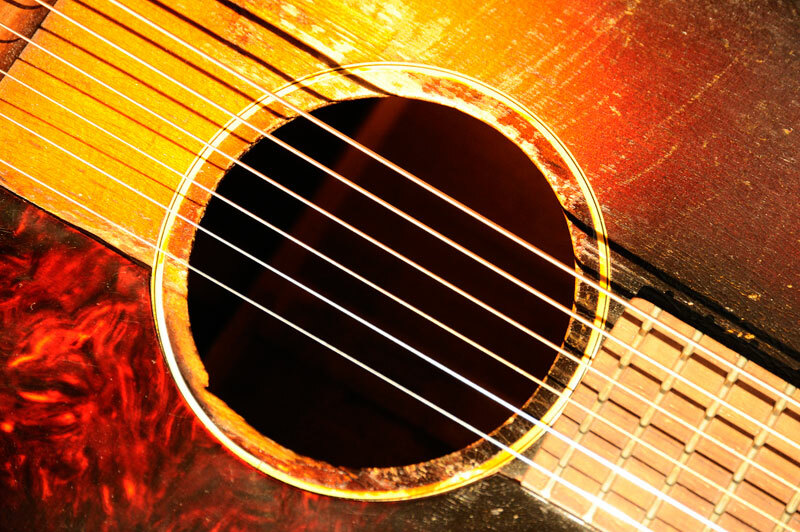 His beloved Max Krimmel acoustic guitar suffered at the hands of airline baggage handlers, so it was converted to a lap guitar in deference to the broken neck, now repaired. The sound is awesome! He also uses an electric-acoustic Weisenborn- style lap guitar made by a friend, Mike Rousey. The pickup combined with the natural acoustic sound is unlike anything you’ve ever heard, and this instrument can be very useful for painting a dramatic picture in the studio. For many years, Spencer was known for playing bottleneck slide on the National steel guitar. Although he rarely uses them in his concert set these days, he still owns two 1928 National Triolians, both stripped of their original paint and left with an appealing brushed-steel shimmer. One of these was acquired from a shrimper in Appalachicola, Florida, in the mid-1970s, and Spencer sometimes tells a hilarious story of that acquisition in his concerts. The other was made from the remains of an antique National guitar, and imbued with a new spirit by Spencer’s dear friend, Dan Erlewine. 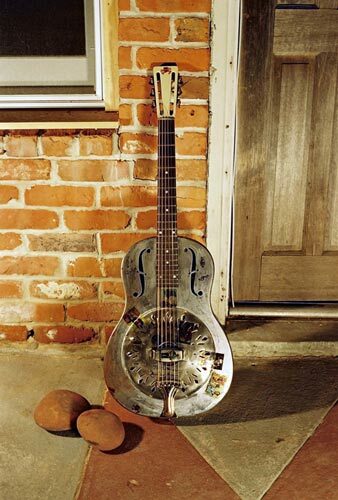 It has a beautiful headstock overlay that makes it a one-of-a-kind instrument. Spencer calls it a National Columbian, after the street where Dan’s shop is located. One or the other of these classic steel-bodied guitars is used whenever Spencer performs his award-winning documentary concert, Down the Dirt Road Blues. As for electric guitars, Spencer’s currently enamored with a small-bodied, two-pickup 1960 Suprodonated after Katrina by Dean Oja, a friend from California. His old black ’60s National “Map Guitar”was seen in many photographs in bygone years, and still has its unique sound. It’s just gotten too heavy and too cantankerous to keep on the road. Spencer occasionally uses his 1950 National Californian, a blonde, Gibson- bodied archtop with tone for days, or a baby blue Danelectro reissue he traded for a pair of cowboy boots. Sometimes the time is right to play a wonderful ’50s Kay “Jimmy Reed” guitar with its dramatic pickguard and old-school sound. And let’s not forget the banjos. The main one was made by Elliot John- Conry at Dan Erlewine’s guitar shop in Athens, Ohio. Dan and his crew have been keeping Spencer’s instruments road-worthy for close to three decades, and when Katrina floodwaters claimed some of them, Dan and Elliot stepped right up and immediately replaced and repaired as many as they could. 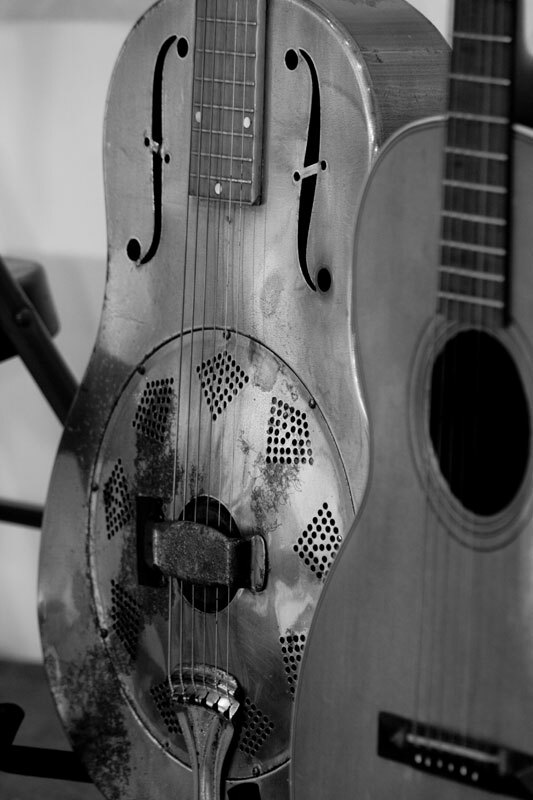 This banjo, along with the aforementioned National steel guitar, was one of those generous gifts. Made largely from Stewart- MacDonald parts, it has a Celtic Cross carved in the heel and a shamrock from County Kerry on the back of the headstock to commemorate a tour Elliot and Spencer did together in Ireland a few years back. Another banjo from Athens, Ohio, was sent after the big storm by an employee of Stew- Mac, and is the prototype for their popular banjo kit. This one hangs on the wall of Spencer’s office, because you never know when you might need to do a little frailing between telephone calls. There are a few instruments that almost never leave the house because they are unreliable at a gig, but still sound fantastic. One of them is a late 19th Century Cincinnatus parlor guitar made by an obscure company whose history seems lost in the mists of time. Rescued from a junk pile, it produces a sound not heard since the advent of electricity. Spencer’s treasured big-body, twelve fret early 1900s Harwood guitar, with a neck so warped it is unplayable except as a lap guitar, recently found a new home with guitarist Robert Eustis, a few blocks away. 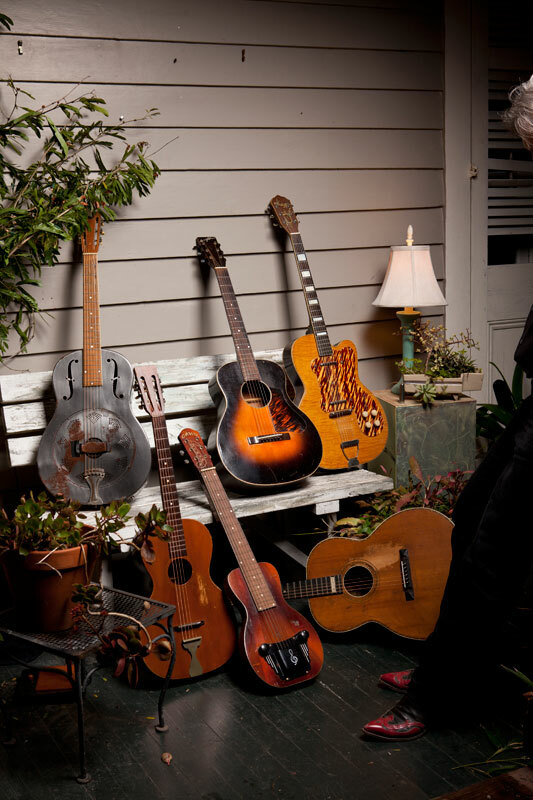 For some reason, people often give instruments to Spencer when he’s on tour, so his closet also contains a small assortment of guitars, antique banjos and assorted instruments that are out of circulation for the time being. If and when they are repaired, Spencer will doubtlessly coax appropriately exquisite sounds from them to add to the soundscape he has conjured for the last forty years or so.